Lock in a fixed electricity rate for two years. Receive the all-new Echo Dot when you sign up! Weekends on Command 24 is rated 3.1 out of 5 by 52. 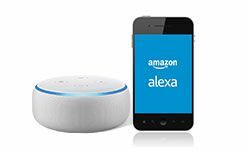 Alexa is the brain behind Amazon Echo – just ask Alexa to play your favorite playlist, set a timer while cooking, switch your lights on and off, change your thermostat temperature, or even check your weather, just with your voice. Now you can manage your energy account without lifting a finger! With Direct Energy's Alexa Skill, you can ask Direct Energy to check your account balance, pay your bill, refer your friends, and manage your weekly and monthly energy usage. 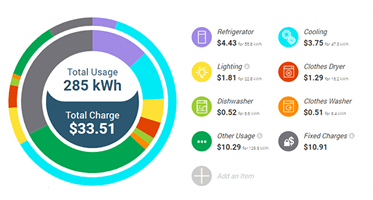 Get a usage breakdown from our insights tool to discover where you can conserve energy and save money. "Alexa, ask Direct Energy to pay my bill." "Alexa, ask Direct Energy for my most used appliance." 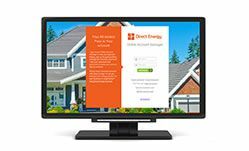 Direct Energy's Skill on the Alexa platform enables you to ask Direct Energy to check your account balance, pay your bill, refer your friends, and manage your weekly, monthly and yearly usage. Have more questions? Check out more FAQs here. *Offer valid for new residential customers in Texas only. Provisioned smart meter required. If you cancel your plan early there's a fee of $135. This plan does not have a Device Recovery Fee. Allow 4-6 weeks for your Echo Dot to arrive. **Use of the Direct Energy skill on Amazon's Alexa Service (the "Skill") is conditioned upon your acceptance of our Terms and Conditions. Please read all applicable rules, policies, and terms including those with Amazon.com ("Amazon"). Use of the Skill is voluntary. By installing the Skill, you are authorizing Direct Energy to share your account information with Amazon to fulfill your request, which will then go through the internet to your Alexa-enabled device. It's possible that your interactions with the Skill may be recorded. Consult your agreements with Amazon to learn more. Amazon, Echo, Alexa and all related logos are trademarks of Amazon.com, Inc. or its affiliates. To utilize all features of the Echo Dot, you will need an 'always on' Wi-Fi internet service. The Echo Dot is provided by Direct Energy, Amazon is not a sponsor of this energy plan offer. Rated 1 out of 5 by Jose43 from Its horrible I honestly regret moving my bill is way to high before I was on a prepaid plan with another company and I was paying way cheaper with the same amount energy I am using now and thatz cuz they didnt offer me free weekends it was still cheaper now i am trying to figure out how to pay me bill because you are charging way too me. If my bills continue like this I may need to end up paying to get out of my contract and go back to the company I was with. I really hate being here I truly regret leaving the other company. Rated 1 out of 5 by Brianne from Horrible plan I chose this electric company thinking I was getting a better plan here....worst decision ever!! My bill is double what it originally was with my past provider. When I spoke with customer service, the rep told me that I am obviously doing something wrong as the most electric is being used during the day on week days....now mind you my children are both in school and I work these days. So how is it possible that we are using more electric on week days. My thermostat is set to 66 while were not home and only 72 when we are....I am currently searching for a new electric company!!!! Rated 2 out of 5 by celloboy77 from Good plan but more expensive The transition to this power plan was very seemless but that was possibily the only thing that easy. The Echo Dot is nice but I'll be honest I never use it to look up information. My biggest problem with this plan is the advertising is deceptive. Quite a few companies have a free weekends plan but this is the only that was advertised saying 100 free days of power (referring to the weekends you would have). My other problem with this plan is the customer service. After 4 different calls about the same issue I didn't actually solve my problem. Rated 1 out of 5 by Willie from Worst Plan I’m sorry I ever changed plans. My bill is double what is was with my old company. Rated 1 out of 5 by Lovebugjessie from Worst plan ever! There is nothing, i repeat nothing good about this plan! I recently switched and my bill was twice as much as before even after they said they gave free weekends. You end up paying over .16 kwh for this plan so you end up with a higher bill and no free weekends. I am switching back after only a month. They never even sent me a bill and when i called they told me i was set up for paperless billing which i never signed up for. Rated 1 out of 5 by corrina from The worse plan I ever had. I bought this energy plan 2 months ago and my bills have never been this high. I am thinking about going back to Ambit and paying to break my plan. 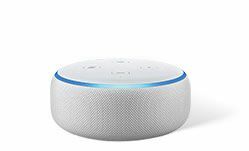 Rated 2 out of 5 by Mike92 from Beware: Two identical plans, 1 with dot, 1 without I bought the free weekend plan a few months ago because I wanted the free weekend plan and the echo dot. I never received the Echo Dot and when I contacted direct energy they said I signed up for the weekend plan that does not have the echo dot. They said that there was no difference between the plans. So make sure you pick the plan with the advertised Echo Dot, because if you pick the exact plan without the advertised Echo Dot, you are not getting it. Wish someone told me this when I was signing up. Is there a minimum fee for a month? I am looking at your plan with free weekends and free Eco. What is the length of the contract if I sign up? Do you service the woodlands area if so what do I need to get started? The free weekend dose it come with free night too or no ?